With Lithium battery pack and powerful 5kw AC motor the Ford Lithium Texan ute is a formidable package. Onboard fast charger means batteries can be bought up to 80% fully charged in just over an hour. The dramatic weight reduction that comes with replacing Lead batteries with a light weight lithium pack and the power delivery of Lithium batteries puts the Ford Texan Lithium in a class of its own. High ground clearance, 4 wheel hydraulic brakes, large 22 inch tyres (turf or road tyre options), the Ford Texan Utility vehicle is a very capable vehicle at an airport, warehouse, zoo, park, caravan park or golf course. The light weight of the Ford Lithium Texan combined with wide turf tyres means low impact on turf or sensitive ground cover. The Ford Texan Lithium Utility vehicle comes standard with powerful 5KW AC motor. 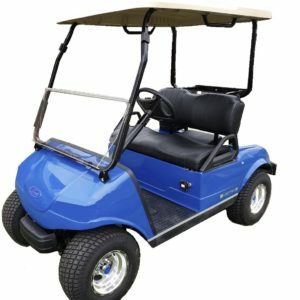 4 wheel Hydraulic brakes, and separate mechanical hand brake, 22 inch Turf or 6 ply road tyres, full perimeter steel chassis, reinforced steel nudge bar and an electrics pack that includes head lights, tail lights, Dash mounted USB jack, 12 volt dash mounted power outlet, and an onboard 48 volt to 12 volt reducer to allow fitting of 12 volt accessories. Optional and upgrades and features include heavy duty tow bar, a safety glass windscreen with electric windscreen wiper and washer, 2 or 3-point seat belts, ladder racks, amber beacon light tool boxes and custom cabinets are also available. For a complete list of models, options and accessories please contact us.